Our prayer life is how we nurture our relationship with God. In our services we tend to pray together aloud in love and gratitude. We may pray for forgiveness, healing, peace and comfort, for ourselves and for others. 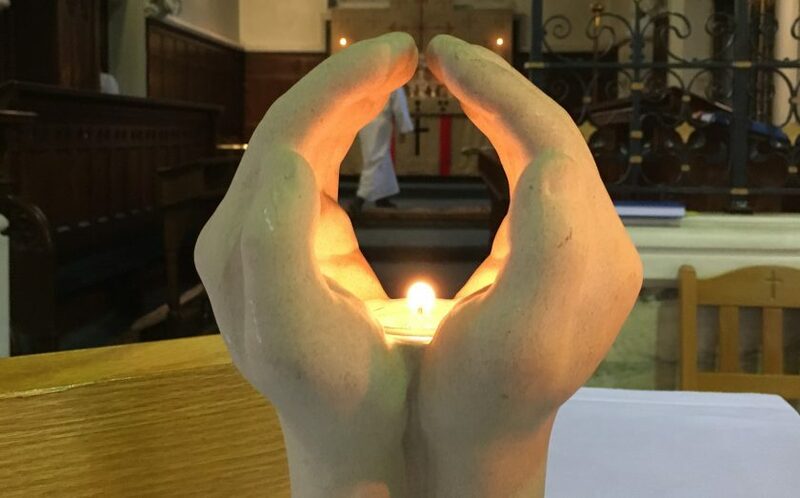 For example, at St Mary’s we pray for a different UK and Overseas parish every day. In addition to this public type of prayer, we often offer individual prayers in which we speak directly and privately to God. Sometimes these are like arrows, sent up to Him in moments of extreme crisis, but hopefully they are more often quiet and meditative communing with his presence. They may not even consist of words but simply a feeling or an intention. Since ‘God has no hands but ours’ we are his instrument in the world. In this way if we follow him, His will will indeed be done. It is traditional to pray in the morning and evening, but God is listening at any time. Similarly, although kneeling is traditional, you can pray anywhere – walking, standing, sitting, whatever feels comfortable. Remember praying is a discipline and may be difficult at times, but don’t give up. Just as with any relationship it takes a consistent effort to flourish. There is nothing you can say that is wrong if you speak from your heart, even if sometimes you are expressing difficult feelings or uncomfortable doubts. No prayer, however inadequate you may feel it to be, is ever wasted. God, your loving father, is listening.